2. Speaking of coincidences, after the Singaporean UWC gathering, I found out that the head of my national committee in the year of my selection is going to Oxford as a Visiting Scholar this fall, too. He did a double-take when he asked me where I was going for uni and I told him, in the car on the way back from the gathering. The UWC gathering itself was … nostalgic enough. It’s funny how time and distance will change your perspective so thoroughly that you wouldn’t even realize it was a recent shift without the intellectual knowledge of it. There must have been a better way of phrasing that. (Who is this woman??? How could she read my mind half a century ago??) And in Pearson, you fall in love with many, many people. It occurred to me recently that Pearson departures always – and are designed to – have a substantial amount of pathos in them. I don’t know if my leaving Singapore was met with as much fanfare as the end of Pearson, and even now, with people leaving for university … I wonder if I’ll feel similarly about leaving university itself? Or as my seniors leave after the first year? Somehow I doubt it. But I would like to be proven wrong. Even minor things the past six, seven weeks, have revealed how it won’t be easy to meet up with people, with schedules and financial constraints and all the mundane noise of life, even when you really really want to, but there are many, many things you really, really want, and sometimes life – and growing up – is about delaying gratification. Or something. I guess. b. The conventional wisdom = “don’t lose yourself in UWC”; to that, I said, sometimes when you lose yourself, you find someone far better. Yourself, of course, again. I’ve changed enough – significantly, almost, but I am always sensitive to any implied accusation in statements like that. I’m not less me now that that’s happened, and I’m not the person I was two years ago. It’s taken me more than a month after Pearson to notice. 3. I DID A MURAL (KIND OF) BY MYSELF TODAY. 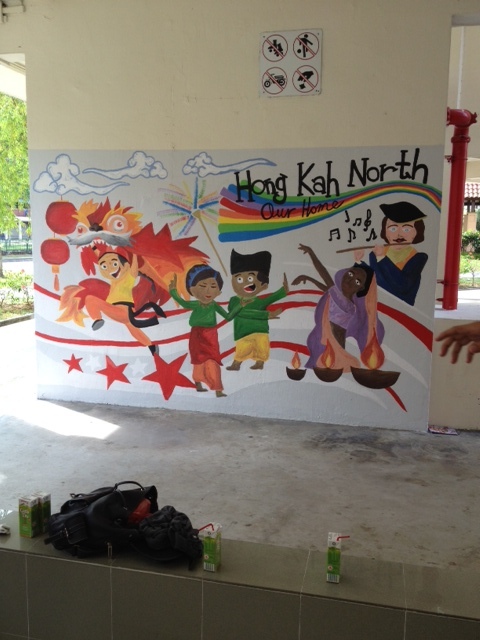 I had great volunteers who did all the base colours and were meticulous and hard-working and considerate and took initiative, which is a huge change from the usual ragtag bunch, and especially fortuitous because my colleague bailed on me without warning both days (sketch + paint with volunteers) this weekend. The design is super cheesy and it’s not a prize-winning work of art by any means, but the sense of accomplishment was giddy. I spent almost twelve hours on this baby. And it’s for a good cause, which I appreciate, and the people – the heartlanders ! – I met were very heartwarming. Alnost makes me regret ending my internship next Monday. Almost. I am very proud of my lion.